Meeting the challenges of the young and elderly through the direct provision of food, clothing and shelter is the priority of this program. It makes available basic necessities that are required to sustain life. For more than thirty years, the Trust has funded projects and programs of non-profit organizations from Bucks, Chester, Delaware, Montgomery and Philadelphia counties as well as the City of Camden, New Jersey. The Trust assists organizations that deliver solid approaches to solving problems. In practical terms though, the depth and extent of the needs continue to be too large for the Charitable Trust to fund on its own. Consequently, the Trustees look to become partners with particular organizations that present opportunities to better serve certain projects. The Trustees continue to concentrate Trust resources where the most need can be discerned and where government or private assistance has not been available. They look for evidence of innovative and smart approaches that address community problems. The Trust has assisted a wide range of organizations that meet varied needs. For example, funds were supplied to purchase new warm winter coats for disadvantaged children in the Delaware Valley region. The cost of building materials and supplies to repair the homes of low-income families and the elderly living in substandard housing in Chester County, PA was covered. A nursing home was able to replace their aging walk-in refrigerator and freezer, which were beyond their useful life expectancy and in danger of complete breakdown. 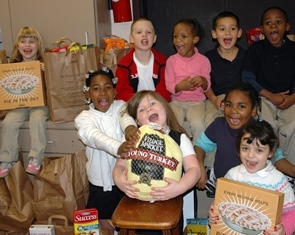 Numerous organizations and food cupboards that provide nutritious food choices and home cooked meals to low-income families, children and the elderly throughout the Delaware Valley were supported. The aforementioned are but some recent examples of the W. W. Smith Charitable Trust’s efforts to help people in need. The Trustees realize that the staffs and volunteers of these organizations, who are providing these services, are the heroes. The Trustees are pleased to help these dedicated, untiring individuals achieve their goals in making life a little better for children, their families, and the elderly. Please click here to download our Basic Needs guidelines and application.